Monday through Friday; daily check in is at 8:00am for breakfast in the Ark Dining Hall, and daily check out is at 6:30pm after dinner in the Ark. Middle School Day Camp has your perfect mix of wild fun, learning, and adventure. 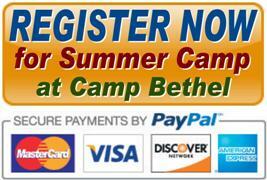 You will live each day in a co-ed family unit of 10-12 campers with 2-4 counselors. Activities for the week include group games, nature, crafts, music and singing, swimming, low-ropes group challenges, creek-play, hiking the camp trails and a singing hike to Horseshoe Bend, archery, orienteering and geocaching, slacklining, 9-Square-in-the-Air, GaGa Ball, 4-Square, Bible study, special all-camp programs and a day on the climbing wall and high ropes course! This is a great week of spiritual development, fun and adventure; exploring your extraordinary faith journey and learning TOGETHER as we are "Branching Out: Connected Through Christ." For an additional fee (billed to you later), choose one of the available "add-on" activities for your chosen dates, (see list and dates below). Be here for an awesome week! Subsidized Fee (discounted cost) = $350; Supporters Fee (actual cost) = $400; Sustainers Fee (cost + $50 gift) = $450. "Add-on" activity pricing is below, and Add-on fees will be billed to you separately. Week-long campers have the option to add River Tubing, Equestrian, Horseback Riding, or Whitewater Rafting (week 2 only), only one per week, and see below for when each is offered. If you are coming to camp with a friend or cabin mate, you do not have to choose the same optional activity. For example, Betty and Sharon can be in the same cabin/unit even though Betty is choosing Tubing and Sharon chooses no extra option. Equestrian (English-style ring riding) (add $105) Available Weeks 1, 3, 6. Saddle up for two days of Equestrian skills and riding at Harmony Equestrian Center, just 4 miles from Camp Bethel! Tucked into these beautiful rolling hills, the fine professionals at Harmony will teach you how to ride and all the basics of horse husbandry. You will gain confidence and skills learning what ‘horse people’ know. This hands-on program for true horse enthusiasts covers horse safety, health and nutrition, grooming and use of equipment so you can tack up and mount for your daily lesson. Long pants and boots with heel required! Helmets, gear and professional leadership provided. Minimum weight 60 lbs. Rated easy-moderate. Horseback Riding (Western-style trail riding) (add $75) Available Weeks 1, 2, 4, 5, 6. Your week includes a day of riding horseback at Reba Farm Inn in Bedford, Virginia. Learn basic horse-care and gain Western-style riding skills along the winding trails and overlooks as you “Giddy-up” close and personal climbing the hills on the back of a one-horse-powered, muscular mare or mustang. (Take the mule-cart for a drive before you leave!) Gear, helmets and leaders included. Minimum weight 60 lbs; “no horsing around!” Rated easy-moderate. It’s our best way to beat the summer heat! Your week includes a fun and relaxing morning of river tubing on the beautiful and historic James River, just 6 miles from Camp Bethel. Let the river do the work as we ride the gentle current through gorgeous scenery over riffles and mini-rapids while keeping cool splashing, swimming and playing. Get creative with your float style or team up with your counselors and new friends to build an ultimate tube-blob-flotilla! Tubes, PFDs and transport provided by our friends at Twin River Outfitters, with counselor leadership provided by Camp Bethel. Rated easy. White Water Rafting (add $115) Available Week 2 ONLY! Your combo-adventure week includes a day of wet, wild & wonderful fun, courtesy of our professional raft guides and the glorious Lower New River Gorge. Learn crucial teamwork and coordination as we paddle “all-forward” through Class IV and V rapids: the “Keeny’s,” the “Railroads” and the “Million Dollar Wave.” It’s an incredibly fun experience; suitable for beginners and soggy-paddlers alike. All gear, helmets, PFDs, paddles and professional leadership included. “Dig in” for adventure and a great day of group fun on the water! Rated easy-moderate.